The 'Stećci Medieval Tombstones Graveyards' are 28 medieval cemeteries in south-eastern Europe. The decoration and inscriptions on the mostly limestone monolithic tombstones represent a specific tradition of the area. They include Christian religious symbols, dancing and hunting scenes, geometric shapes and Cyrillic inscriptions. The inscribed tombstones have been selected from the surviving 70,000 or so still standing in the region and date from the 12th to the 16th centuries. The singular ‘Stećak’ (plural: Stećci) means ‘tall, standing thing'. The Stecaks or Stecci will be a transboundary and serial nomination for 2015, and I think it has a good chance to get inscribed. It's kind of ironic that former enemies Bosnia Herzegovina, Croatia, Serbia and Montenegro have joined hands to submit a series of cemeteries and tombstones. As if there aren't enough modern cemeteries around (especially in Mostar) to remind of the 1990's war. Stecaks are monolithic tombstones, dating from the late Middle Ages. 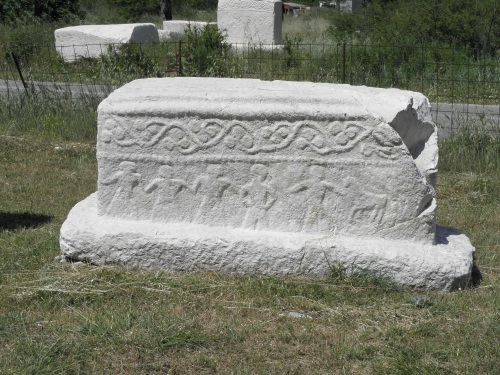 I visited the same site as Assif (see his review below): the Radimlja necropolis in Stolac. This site is one of the largest and most important among the 22 Bosnian parts of the serial nomination. At first sight it is just a collection of white stones in a field. But when I came up close, I noticed all the different decorative carvings that cover most of the tombs. There are crosses of course, and a kind of flowers or trees. But also men on horseback with bow and arrows. And the most enigmatic ones: knights holding up their right hand as if to wave hello. I spent about half an hour at the site, looking at each tomb from the back and front. I was really enjoying this visit more than I had expected. Sometimes you'd only see the carvings when you're right in front of it. I had arrived by bus from Mostar, some 35 kms and 45 minutes away. The site is signposted, both 5km before and when you're there. It's a field at the right side of the road, bordered by pine trees and the shiny white of the tombstones stands out. You cannot miss it. There's no security at the site, no entrance fee and just a small information panel. Getting back proved to be more difficult. There's no real bus stop near the site. And the schedule of the buses is unclear. The LP guide writes that there is a bus once an hour, but I doubt that (more like once every 2 hours). I waited for awhile at the kiosk across the road, where the young guy behind the counter took it as his goal to get me back to Mostar. First he planted two chairs and an umbrella beside the road, so we could watch the traffic for any buses and wave them down. When that wasn't a success, he phoned his mother if she wanted to find out from the bus station at what time the bus would leave. Moments later a truck driver stopped for a hamburger and a drink. The boy asked if he had to go to Mostar, and would he take me? The answer was Yes, and so I made my way back in the front cabin of a large truck (for the first time in my life as far as I remember). 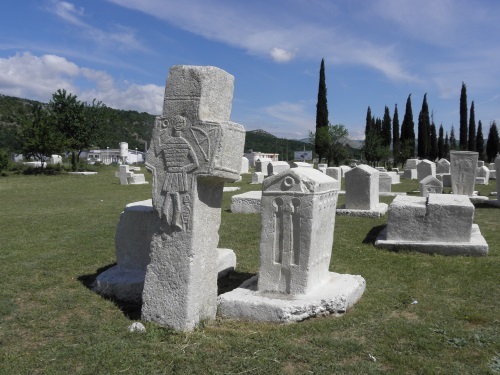 The Stećci Medieval Tombstones Graveyards are made up of 28 sites across Bosnia and Herzegovina, Serbia, Montenegro and Croatia. 22 of the sites are located in Bosnia and Herzegovina and we stopped at the Radimlja Necropils located about 30 drive minutes from Mostar. The Radimlja Necropils is one of the most well preserved sites and contains decorated tombstones dating back to the 1480s. The site was quiet and had a small entry fee amounting to a few euro. We were among two sets of visitors there at the time. Read more from Elaine McArdle here. We commenced our “stecci search” across Croatia, Bosnia, Montenegro and Serbia with a fair degree of enthusiasm, having identified 8 out of the 28 locations which were on or close to our planned general route which was primarily designed to pick up other unvisited WHS. Our first location was 1504-023 Velika and Mala Crijivika, situated just west of the village of Cista Provo some 11kms north of the main Croatian motorway. The main area of stecci straddles the road and is marked with a Croatian flag - a smaller one lies around 200 metres further west which might as well be seen. A notice board describes the site but, unfortunately it has been used for target practice by local hunters! There are around 90 tombstones which exhibit a nice variety of carving and the entire site is of interest for having remains (tumuli and cisterns) of human habitation going back to prehistoric times. If you only wanted to take in 1 stecak site, then in my view, this would do very well, being close to the coastal towns of Split etc. Our next location was 1504-006 Dugi polje at Blidinje in Bosnia. If you are wanting to go inland from the Split area to Sarajevo then this can be nicely taken in for the cost of a few kms of small/rough roads from it to Jablanica. Blidinje is on Bosnia’s T List for its mixed values and is also a skiing area. The T List cultural aspects include 11 Stecci necropoli including this one already inscribed! This was the most scenically interesting of the stecci sites we visited – it lies a few kms east of Blidinje lakes and it overlooked by what were, in early June 2017 still snow-capped mountains. The 150 stecci were interesting also, with a range of carvings and a reasonably useful notice board describing the more significant ones. The location is NOT signposted anywhere around but the coordinates on our map are 100% correct. If you are going east from Lake Blidinje then bear left along a dirt road just after a very large hotel/restaurant called “Hadjucke Vrleti” (the only one in the area!) for a few hundred metres. Our third location was 1504-028 at Perucac in Serbia. This can be combined quite neatly with a visit to the Tara NP and Drina Canyon but, in terms of its own “value”, we were very disappointed. The previous reviewer seemed to gain some benefit from his visit, for which I am pleased, but these 88 tombstones (only 1 of which is even minimally decorated) seemed to add nothing to what we had already seen. The notice board set at the entrance to the little park on the eastern outskirts of Perucac was the only one of the 3 we saw which referred to UNESCO - in this case that the site had been placed on the T List! I note that ICOMOS persuaded the nominating parties to remove 2 of the original nominated locations during the evaluation and even then, recommended deferral of the nomination in order to, inter alia, “Provide a clear and specific rationale for the inclusion of each of the component sites in the nominated series in terms of the proposed Outstanding Universal Value”. ICOMOS also “notes that this transnational serial nomination powerfully demonstrates that heritage can be a catalyser for peace, and acknowledges the importance of the efforts made by the four States Parties to work together to propose the inscription of their shared heritage of the stećci for inclusion in the World Heritage List". I suspect that the inclusion of a few locations from Serbia was more about supporting this aspect of the nomination than the OUV of the locations! So, it was about at this point that we decided we had “done” Stecci! To put effort into picking off further locations would have been obsessive. We had got the idea, had seen some nice carvings and scenery, had read the information boards and AB evaluation (but not the enormous 1.273mb nomination file!) and didn’t intend doing any more research into “Balkan Mediaeval Funerary Practices”. Site visited July 2016. I visited two newly inscribed stećci sites in Serbia, Mramorje – Rastište and Mramorje – Perućac. Both sites are quite near each other in the vicinity of the border town Bajina Bašta which is also a good hub for visiting Tara national park (tentative site). Mramorje in Rastište site actually consists of two separate graveyards in the areas of Gajevi and Uroševine that are located 500 meters of each other on the slopes of mount Tara. Finding these places was a bit of an adventure itself but I like challenges when searching for the world heritage sites. I left my hotel early in the morning and took a taxi towards Rastište church which is 22 kilometers from Bajina Bašta. It was a hot day so I had to take lots of water with me. The first graveyard was quite easy to find using Google Earth as my reference. From the church I walked the serpentine road uphill about one kilometer. Then I turned right to a path that is heading to a small farm. The Gajevi area graveyard is just along the path. In this graveyard there are 35 tombstones. The stones are placed next to each other in three or four long rows of east-west orientation. There is very little spacing between the stones. It was difficult to take photos because the white polished tombstones shined so brightly in direct sunlight. I didn’t find any decorations although there should be crescent reliefs on three tombstones. Nearby the graveyard there is a quarry where the stone blocks used to be taken from. The second graveyard in the Uroševine area was much more difficult to find despite of being near the first graveyard. At first I chose two wrong paths before I found the right one. Actually these detours were quite nice because there were beautiful views to a mountainous farming landscape with haystacks, sheep herds, farm houses and plum trees. I kept on searching and a finally I found the right way that was a small grassy path under the trees. I followed the path downhill and there was the graveyard surrounded by thick forest. In Uroševine graveyard there are 33 tombstones. Some of the stones have typical east-west orientation but surprisingly some of them have north-south orientation. I noticed that the tombstones in Uroševine area are in bad condition. Some of them had crumbled in small pieces. So that wasn’t very spectacular sight. After I have visited Uroševine graveyard I realised that it is just 100 meters from the Rastište church so the best way to visit it is to walk small path uphill from the church. After I have visited both these Rastište graveyards I walked nine kilometers downhill to the Perućac village. Mramorje in Perućac is very easy place to visit because it is located in the center of the village of Perućac just beside the main road to Bajina Bašta. There are 88 tombstones at the graveyard. Most of them are in a good condition but none of them are decorated so you can't find any specific details. While the graveyards in Rastište are quite unspectacular, I found Mramorje in Perućac quite imposing and pleasing place to visit. I think these two stećci graveyards in Serbia doesn’t show the best that this nomination could offer. These Serbian sites seemed to be more of a curiosity compared to some other examples. 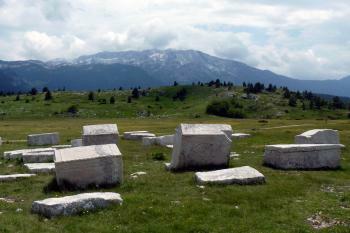 So I look forward to see some of the better graveyards especially in Bosnia and Herzegovina. 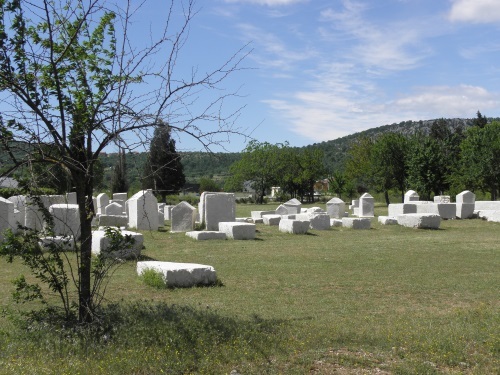 Radimilja is a small cemetery near the road leading to Stolac. 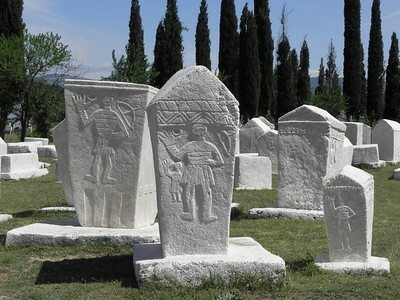 It is the most famous Mediaeval cemetery in Herzegovina and has some nice tombstones. It often features on touristic prospectuses of the area. 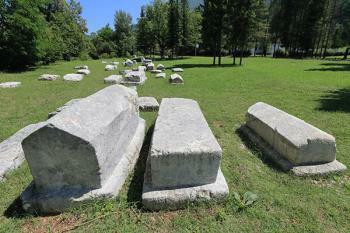 The graves belonged to the Bosnian church, a branch of the Orthodox church which died out when Herzegovina became predominantly Muslim with the Ottoman conquest. Nonetheless, local Bosniaks still relate to this church as a symbol of their national (or better ethnic) identity. The cemetery is easily accissible by car. It is, however, very small and you can finish seeing all of it in about 15 minutes. Nearby Stolac is also on the T-list and atop the hill you can visit the Illyrian town of Daorson. Part of Cultural nomination rejected: The World Heritage Committee welcomes acceptance of ICOMOS recommendations by the States Parties, namely in reducing the number of components proposed for inscription by removing the “Stare Kuće, Donje Breške, Tuzla” and “Mramorje in Buđ, Pale” components (no's 12 and 18).